After alot of research I finally committed to buy a Sangean CL100 and it arrived today from Amazon, free shipping from this particular seller. It might just be the "I have a new toy" syndrome but I am thrilled to death with it! Setup was very easy with many cool options such as: the option to program up to 25 counties with the choice of only receiving alerts from your home county, or using the others as needed. For example, I have all the counties surrounding my home county programmed in so I enable those as needed. Another option I really like is the ability to set the volume level on either the Voice or Siren alert, the "low" volume level is still pretty load but hey the idea IS to get your attention but unlike some weather radios, the alert town doesn't BLAST out suddenly and scare the heel out of you, CL100 alert starts at a low volume and gradually increases. Adjustable lighting on the screen and different tones and colored lights for advisory, watch and warning alerts are also handy. Stormy weather is predicted for the weekend so maybe I'll get to see her in action! I will try to post here occasionally to report and problems that develop. What does everyone think of a thread that members could review the radios they use? Only thing I've gotten sofar on my CL100 is a weekly and I wasn't here for that although I was able to review it...plus the newest firmware build for those radios has that product in siren defeat mode. I was surprised at how sturdy it seemed to me when I got it. The sound for just a tabletop radio is pretty good. The Reecom 1650 has the ability to set the alarm tones in steps from 0-10 as opposed to low-med-high but that's not really a deal breaker. I have both radios and have put the Reecom in the back room. I agree. I like the ability to program up to 25 counties but activate/inactivate any of those as opposed to having to delete then reenter if wanted again. That's a neat little feature as I have one county to my NW that is so large that storms might roll through it that about 70% of the time won't affect my location, but it's that 30 percent I worry about. This feature allows me to disable warning for that county for a time if I need to, then re-enable if they need to be enabled. I've had the Sangean CL-100 since Jan 01, 2012 now. It's one of the better weather radios I've ever had. But, it does have its share of shortcomings as you will see later in this review. 1.) An AM/FM radio - Good reception. Sound quality is ok for a clock radio, but nothing to write home about there. Not a high quality sound. There is a headphone jack on the back of the radio. Which is a plus. The audio sounds better though the headphone jack than it does through the speaker, in my opinion. I do, however, wish the headphone was on the front of the unit though. It's kind of difficult to plug into the back. One has to turn or pickup the radio to do it, for the most part. The radio itself has 6 programmable preset buttons on the topside of the unit toward the bottom. You can program 6 FM stations and 6 AM stations for a total of 12 overall presets. There is a separate selector switch to switch between the AM and FM modes. 2.) Alarm Clock - This unit is a fully functional dual alarm clock. It features a snooze button, a setting to wake to music or beeping alarm, an independent volume control for both alarms, and a special day of the week feature. This day of the week feature allows you to set individual alarms for days of the week. For example, you can set alarm 1 to wake you up at 7am Monday through Friday, and have alarm 2 set for Saturday and Sundays at 9am. There are various ways to set this up to fit your needs. When the alarm sounds, it starts off at a low beeping pattern and gradually increases in volume until hits the max volume you set. After about a minute of beeping it will stop, and then start again with the beeping cycle from low to high volume. The wake to music feature works in a similar manner in so far that the radio will increase volume gradually until it reaches the preset max volume that you have chosen. Not only will the RBDS signal reset the clock, but in some cases provide song title data, if the radio station is transmitting this type of data. In my area some will transmit song title or program information, while some others will transmit just a radio station call sign and that's it. The one thing I don't like about the alarm clock function is the dual alarms are turned on-and-off via two small three-way slide switches on the right side of the unit. One three way switch of each of the two independent alarms. They are not well marked from a distance, hard to read because of being located on the side. So, it's quite a challenge at times to pick out which one is alarm #1 and alarm #2. It's also hard because of the three settings on each switch itself. Wake to radio is at the bottom selection. Alarm off is the middle selection. And finally, wake to alarm it the top selection on the slider switch. It's hard to keep straight until you memorize it, or watch the display carefully as your fiddling with the switches inconveniently located on the side of the unit. Try doing this at night with little or no light on, or while groggy and tired. 3.) Wx alert functions - Typical SAME technology. The CL-100 can display upto 20 warning messages, and can cycle through them manually via the tune up and tune down buttons attached to an mp3 style circular control button. The Wx radio also shows the amount of time left in a particular alert, witch is a very handy feature. I just wish it was displayed bigger in the display. More on the display shortcomings later. The big, big, big, plus to this radio is that this radio WILL ADHERE TO THE NWS "END OF MESSAGE" TONES. Most Midland radios that just have a five minute timeout timer feature, and will not mute when the NWS tones are received. Five minutes is a lot of time that the radio is blarring in the middle of the night, so I prefer to have the radio shut itself off when the NWS tone is received. 4.) SAME alert lockouts - The unit has programmable lockouts for weather alerts. I have mine set up to lock just about everything out except tornado warnings. There are a few alerts that can't be locked out, but I don't remember all of them right this second. I know a couple of them were civil emergency related. It would be nice if weather radio manufacturers would have some sort of daytime/nighttime alert features that would allow different lockout strategies during certain hours of the day. 5.) 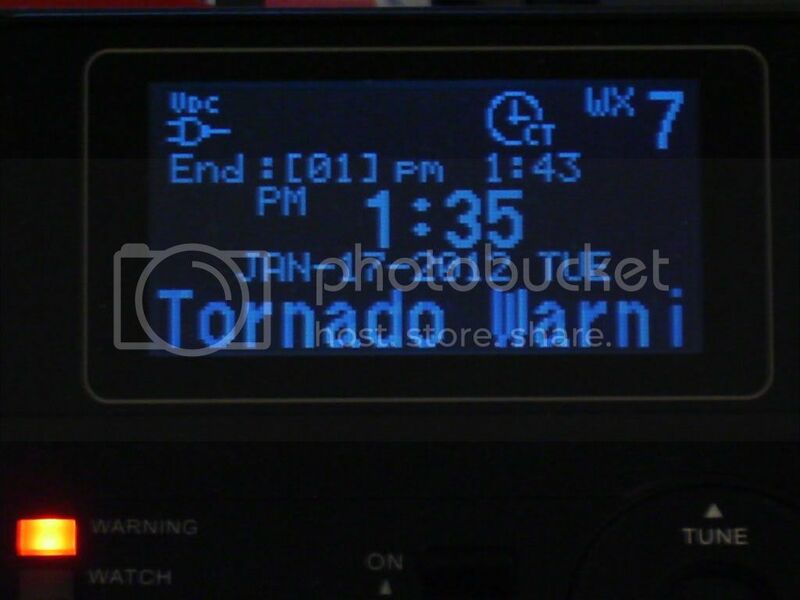 The Wx radio's display - The display is unfortunately the one weakness of the radio that I don't like a whole lot. I do like the fact that the display fully alpha-numeric and warning messages will scroll across the bottom of the screen. The background is a white text on a blackish gray background. It's bright and good looking in general. But, the display is relatively small in nature. The display is non-adjustable angle wise, and has a poor viewing angle (up, down, and side-to-side). You will have to tilt the entire radio if your going to use this as a radio by your bed. The unit doesn't have any sort of built in kickstand either, so your going to have to put something under the radio to tilt it. The other thing I don't like is the brightness control. The dimmer has three settings, but the lowest one is still too bright for use at your bedside, in my opinion. There is a way to set the radio up where the back-light of the display will turn off after a user defined amount of time, but I'm not a fan of that option because anytime I want to see what time it is I have to reach over and press any key. That's something I don't really want to be doing at night. With all of this in mind, I think the radio makes for a good desktop radio, but a questionable bedside unit. Luckily in my case, I have a back lit large display clock across the room that has dimming, that is easier on the eyes at night, in my personal opinion. A clock that I can see anywhere in the room, unlike the CL-100 that has a poor viewing angle. 6.) Power - The unit is AC and can work off of batteries for a short while. I haven't really tested this feature out thoroughly, but during a two hour blackout recently the basic functions kept going, and all my settings were saved, so I'm happy about that. 7.) Ease of programming - The radio uses a scroll down menu system which is wonderful. Everything is arranged neatly. But, the radio gets low marks from me in one very important area. During programming (of nearly any setting) you only have about five to eight seconds to make up your mind before the radio kicks out of menu mode and back to your regular clock display. Meaning, if your two or three levels deep in the menus, and you stop to think for a few seconds on how you want to set setting x, you run a high risk of getting timed-out and starting all over again. This is VERY frustrating. Especially, while your trying to learn your new radio, or your trying to program thing while your half asleep in the middle of the night. In summary, the Sangean CL-100 makes for a wonderful desktop weather alert radio, and will work well in any room of the house. Except, perhaps the bedroom, in my opinion. Despite all the shortcoming this unit has that I've listed above, the unit is still a solid well built unit that will definitely do the job of keeping you informed, and keeping you safe, during times of severe weather of during civil emergencies. In the end, I give this radio a rating of 3 1/2 out of 5 stars. Very through review Tusker, thank you. I had XM radio when i drove a truck, it used RBDS or something similar, very handy when a song comes on and you don't know who the artist is. I was so used to having RBDS that when a song came on, I'd automatically glance at the radio for info, RBDS or not . I haven't found any stations that uses RBDS in my area. My radio was without power (not plugged in & no batteries) for three days and it retained all programmed info except the clock of course. But, the radio gets low marks from me in one very important area. During programming (of nearly any setting) you only have about five to eight seconds to make up your mind before the radio kicks out of menu mode and back to your regular clock display. Meaning, if your two or three levels deep in the menus, and you stop to think for a few seconds on how you want to set setting x, you run a high risk of getting timed-out and starting all over again. This is VERY frustrating. Especially, while your trying to learn your new radio, or your trying to program thing while your half asleep in the middle of the night. OMG!!! This problem is MADDENING , After three timeouts I put the settings I wanted on paper before programming. After nearly four weeks use I'd give it a 4 out of 5. The star rating idea is a very good idea Tusker. I know that this post is somewhat stale but I'd like to add my comments regarding the Sangean CL100. I had a Honeywell Weather Station that had the SAME radio built into it and the weather station finally needed to be replaced and with it the weather radio. I just purchased this unit after searching a number of different weather radios and none seemed to measure up, so to speak, to what I was looking for. I came across this unit and the reviews were both good and bad but more good than bad. I really liked the fact that it pays attention to the "End of Message" tone from NOAA and that was the biggest reason for purchasing this unit. The setup could not have been easier. I have no plans to use this radio as a beside radio. i purchased it strictly for the weather radio features that it has. 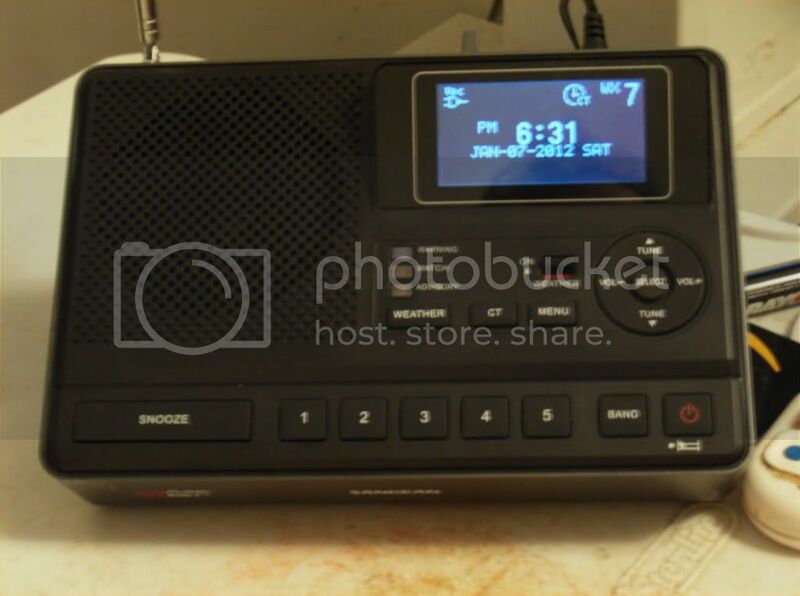 I think this radio, along with my new Davis VP2 Pro have satisfactorily replaced my old Honeywell unit. The radio is well built and compact. It fits very nicely on a small stand we have set up that holds the VP2 Console and the weather radio. Now I'll need to wait for tornado season to begin to see how well it reacts to the weather alerts for our area. I'm sure it will work as advertized. The price was right as well. I purchased it from Amazon and the discounted price of this radio made it even more attractive to me with the many features that it has to offer. "Man proposes and God disposes." Hey Butch, I think you'll be very happy with your Sangean. I've had mine 8 mos, we've been thru many severe weather events, lost power for hours and it never failed. My only complaint is the alert tone is way too loud even on the lowest setting but I guess yhats my fault because I'm using it on my bedside table for am talk radio to put me to sleep. I think if I had that radio that close to me when it alerted, it would give me a heart attack. The one thing for sure is that even on the lowest setting it is still way too loud. But that is fine, we have it located in our dining room and it is a good distance away from our bedroom so we can hear it go off for sure but it it is not too bad. We have it mainly for storms and tornados and I'm sure I will like it too! Thanks. I would highly recommend the Sangean CL100 unit to anyone interested in purchasing a home NOAA weather radio. I would like to share a smartphone app that I will also highly recommend, iMap Weather Radio. Available for both iOS and android. A NOAA weather alert radio and more, in your pocket! Typically it's $9.99, and a real bargain at that price, but with a little digging around in Google a copy can be had for free. I just got mine. Setup was very easy. It has some great features like dual alarms. My only complaint is that even on the Low setting the alarm is really loud! I bought it to use as a bedside radio and boy will this thing wake me up when there's a Warning issued! Overall I really like it. I wish the screen was a little bigger, though. I had a question about the Voice Alert mode. I have the siren volume set to Low. After it plays the siren for 8 seconds and switches to the voice announcement, is that volume level set to whatever I have the AM/FM/Weather band volume level already set to? Or does it play the Voice, alert at a louder volume independently of the regular Volume setting?